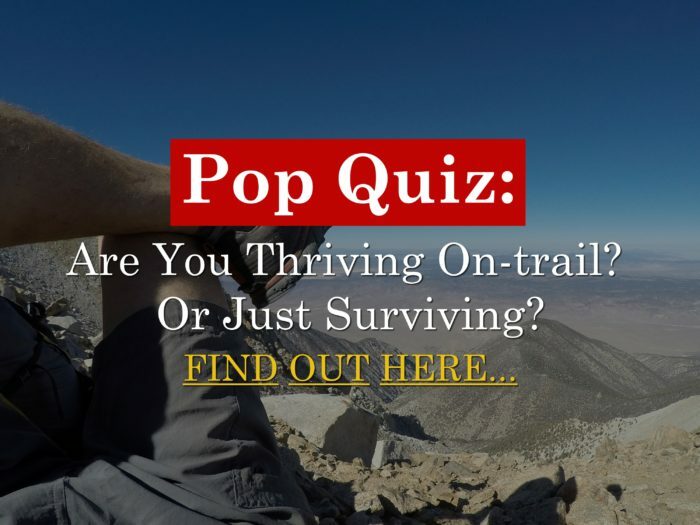 Quiz: Are You Thriving On-Trail? Or Just Surviving? Are you thriving on-trail? Or just surviving? Find out in this new quiz, designed to help you thrive. Regardless if you hike long-distance trails for sport or recreation, how you feel while you’re out there matters to me. Not only because I want you to feel good when you’re on-trail, but because I want hiking long-distance trails to be seen as something healthy; because ultimately, I think it is. However, when people who are attempting to complete a long-distance trail are complaining about the following things, or worse, have to leave the trail and cut their attempts short because of one or more of them, it bums me out and gives the trail a bad reputation too. A few of these things have ended some of my own trips prematurely in the past and I’ve even heard of them stopping people from attempting to do a long-distance hike in the first place, in fear and expectation that these things will happen to them. While some of you may be okay with this, less trail traffic, having people scared to go hiking or not completing their hikes because of these things is simply not okay with me. Use this Pop Quiz to find out how your current hiking style will do in the long run and to see how well it’s doing today if you’re just starting out. For this test, it’s not about how many miles you’re doing, it’s about how well they’re treating you. Pop Quiz: Are You Thriving On-Trail? Or Just Surviving? This quiz is designed to help you gauge how well your body is reacting to life on-trail. By looking at where you generally stand when it comes to these 10 things, you can see if you’re thriving out there, or just surviving. In the end, add up each question’s score then rate the total against the scale. Along with each question, I’ve provided ways to improve each score. During this process, be honest with yourself. This isn’t an investigation meant to judge, it’s a review meant to bring awareness and solutions. Question 1: How’s your body feeling? Expand: How do you feel out there? Are you in any pain? Taking Ibuprofen? Do you have any new or unusual ailments/complaints? Ex: Shin splints, pains, soreness, headache, swollen feet. +1 point if you have no issues to complain about. -1 point if you have a pain or discomfort that could use attention. Solutions: By pre-conditioning your body to the hiking lifestyle, many of the initial complaints that can slow or end a long trail hike can be prevented, especially blisters. By getting to the root of the deeper pains – toxic salts & acids, tight/dry tendons & ligaments, dehydration or a lack of electrolytes, etc. – the need for Ibuprofen can be minimized or decreased to nil. Question 2: How are your energy levels? Expand: Do you have enough energy to visit the nearby features that the trail accesses, or do you pass them by in want of forward progress? Do you have extra energy for doing voluntary trail work as you hike, or is it enough to just hike? How do you feel overall? Tired or energized? +1 point if you have extra energy to give away. -1 point if you need everything you have just to get thru. Solutions: Although hiking is technically exercise, is a very basic and repetitive one. By adding other movement practices into your daily routine – trail work, calisthenics, climbing, parkour, slacklining, ect. – more energy can be cultivated. As Arnold once said: “You have to shock the muscle!” I know it can be easy to get stuck in the hike, sit and rest, hike, lay down and sleep routine, but by intentionally adding different experiences for your body to react to, it will be more awake in need of having to respond to those new and exciting stimuli. Question 3: How positive is your outlook or mind state about the journey? Expand: When you’re hiking on a long-distance trail, are you the one who’s giving magic, or are you the one who’s in need of it? As you move each day, are you feeling confident in the success of the journey, or are there things looming ahead that have you feeling like maybe you won’t make it? +1 point if your outlook on the journey is positive. -1 point if your outlook on the journey is not looking so good. Solutions: It’s amazing what having the right gear and nutrition can do for your tolerance and enjoyment levels during a hike. A few ounces can be the difference between freezing and feeling cozy, and being famished or feeling satiated. In the end, it’s the challenges that help us grow and evolve, right? On the second time thru a trial, the tribulations that may have ended or caused stress during the first attempt are oftentimes not even seen as issues, having already dealt with them before. With experience comes trust, and with repetition comes confidence. Even if you’ve never done whatever it is before, see yourself succeeding and take a hard look at the obstacles of concern – waterless sections, navigation, energy levels, etc. – then downsize them to become less of a burden by becoming experienced at them. Question 4: How well do you sleep at night? Expand: Do you fall asleep quickly, or do you lay there feeling restless? Do you wake up ready to face the day, or are you still bonked, trying to rewind the sun? +1 point if you would say that you sleep well. -1 point if you have issues falling asleep, staying asleep, or getting up from sleep. Solutions: Better sleep can be attained by not overdoing it during the day. Go big, but don’t outdo yourself. Take the extra minute to find a comfortable spot to rest at. Make sure that the ground and surrounding area are conducive to getting a peaceful night’s rest. In the morning, start the day with thoughts of gratitude for what you’ll be doing, followed by light stretching or yoga. Make sure to drink water both before and after sleeping. And if you can’t sleep, take time to write out your goals, dreams, visions, worries, concerns, etc. Like taking off a heavy pack, simply by writing something down, its weight of attention can be removed from the mind. Question 5: Do you feel recovered each day, from the efforts of the last? Expand: Are you ready to keep going, or do you need to take a break? +1 point if you feel just as healthy or even healthier now than you did on Day 1 of the journey. -1 point if the journey is taking its toll, and you need time to catch up and recover. Solutions: Here’s a post I did last year which contains 3 Recovery Hacks for the Rest Break. These things help to reduce recovery time by increasing its efficiency. Question 6: How’s your attitude towards the trail? Expand: Let’s be real, are you loving it out here, or is there something making you want to ‘go home’? +1 point if you can handle it all with a smile on your face. -1 point if you can only deal with hiking when it’s done under certain conditions. Solutions: In the early 90’s, Ray Jardine had touched upon how mineral deficiencies can affect your attitude towards the trail. In short, if while on a distance journey the body develops mineral deficiencies, it can begin to make excuses in an attempt to return home, to the safe space where that wasn’t an issue. The manifestation of this is that the hills get hillier, the wind gets windier, and the bugs get buggier. Part of thriving in any environment is being able to fight off pests and tolerate nuisances. If something’s getting the better of you, is it really the thing, or is it your attitude towards the thing? While you can’t control the weather, you can control your interpretation of it. Question 7: How’s your appetite? Expand: Are you experiencing Hiker Hunger, or are you feeling satiated? +1 point if you feel like you’re well-nourished. -1 point if you feel like all you need is more calories. Solutions: If your nutritional fire is getting the best of you out there, slow your metabolism down by switching your diet and food-thinking from calorie-rich to nutrient-dense. The cells of the human body don’t know math, but they do know proteins, oils, and nutrients. Once your fire is burning more effectively, you’ll also find that its output increases in efficiency to match. Question 8: How are your bowel movements? Expand: Is your daily deuce something to be proud of, or are you like WTH? +1 point if you feel like things are regular. -1 point if you’re like WTH when you take a dump. Solutions: Overeating or eating the wrong kinds of foods can lead to gas, cramps, indigestion, heartburn, nausea, and worse. If your exhaust is blowing black smoke, sort of speak, try running a cleaner source of fuel and adjusting the timing. Question 9: What’s your body odor like? Expand: (You may need a friend to help with this one.) Let’s face it, we all stink, but do you smell like compost, or sewage? +1 point if you stink but it’s not offending you. -1 point if you stink but it’s offending even you. Solutions: Here’s an image I put together that can help you keep your in-town freshness, even when you’re out traveling in the wilderness. Question 10: What’s your typical trail experience like? Expand: Do you have your head down all the time, just trying to finish the hike, or are you out there with your head up, taking it all in? Are you adjusting your pace to match the terrain as it arrives, or are you just focusing on the numbers and mashing it all in the same fashion? +1 point if you feel like you could keep going when you reach the finish line. -1 point if you collapse at the finish line and need to be taken home on a stretcher. Solutions: In my opinion, true endurance comes from doing something you love. Whenever I get frustrated, I look at the reasons why I’m doing it. Whenever I get tired, I remember what it is that I’m working towards. When these 2 things are aligned, my why and my where to, the effort that it takes to get there becomes both effortless and limitless. THE GAUGE: Are you thriving on-trail? Or just surviving? +10: Congratulations! You’re not just hiking and living the dream, you’re thriving on every level! +6 to +9: Nice work! You’re getting the job done and leaving the place better than you found it too. +3 to +5: You’re almost to paradise. Just a few steps in the right direction and you’ll be there. -2 to +2: You’re on the right path, but it’s looking like unless something changes, you could be destined for injury or fatigue. -3 to -5: I feel you. I was once there too. What’s helped me thrive the most is taking personal responsibility for my environment, mind state, and interpretation of the world. Pain and discomfort – when faced, not ignored – can be a great teacher and motivator to get to a better place. -6 to -9: You might be on the bench right now but the game’s not over yet. With a new strategy for your gear, a new approach to your movement, and a new game plan for your nutrition, you could be 2-10x’n your mileage and enjoyment level in no time. -10: Still looking for where your score is? If this is you, don’t worry. All hope is not lost. (Un)Like a new year’s resolutions list, follow the 36 Health Hacks that are found on my page here and by this time next year you should be at least halfway to thriving. If you’re not, let me know! Being in survival mode takes energy and puts unnecessary worry on the mind. When your thriving though, you become a producer of energy and are more at peace with yourself. Only by checking in can you know where you’re at, whether you’re in the middle of a long-distance hike or just living. To learn how I keep myself on the thriving side of this Pop Quiz, visit here. Interested in sharing your results? Leave your score below and tell us what you think you’re doing right, and what you think you could do to improve your score. I look forward to hearing what you have to say. For additional tips on wellness, nutrition, and long-distance hiking, visit: Whole Food Hiker. Dryer sheets! One dry sheet can ruin all your high tech wicking clothing. Dryer sheets contain paraffin waxes and VOC containing fragrances do not use. Nice catch Colin! I guess I was taking that part for granted. I don’t actually use them in the dryer, I keep a few of them in my sleeping bag, pockets, and stuff sack. I used the chemical kind of dryer sheets growing up but never had an issue with them ruining my clothing. I have seen them (on the manufacturing and production side) ruin a lot of landscapes though, creating those VOC’s you mentioned. Unfortunately, high tech wicking clothing is covered in PFCs which are just as toxic as VOCs. It’s been a slow transition for me but over the past few years, I’ve been switching my high tech poly clothing to wool-based and silk for the trail and organic hemp and cotton for between times. Thanks for your insight! Same thing goes for lotions, hygiene products, bug pro, and essential oils or deodorants. But who cares about this stuff? WHAT WAS YOUR SCORE?